Writer-producer Allan Balter (1925-1981) died before his time because his physical heart wasn’t up to the task of powering his talent. 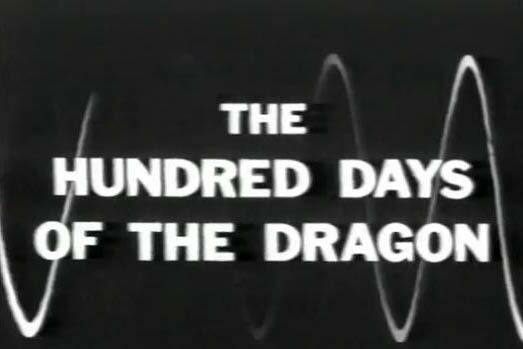 Balter co-wrote (with Robert Mintz) one of the most memorable episodes of the original Outer Limits series, The Hundred Days of the Dragon. An Asian nation hostile to the United States assassinates a candidate for president and substitutes its own double. The story mixed science fiction with espionage. He also co-wrote (with William Read Woodfield) some of the best episodes of Mission: Impossible. That partnership would last for years, beginning during the first season of Voyage to the Bottom of the Sea (where Balter was associate producer) and extending to the early 1970s with the television version of Shaft. The Woodfield-Balter duo made an impact early in the first season of M:I and were brought on full-time with the title of script consultants. That continued into the show’s second season. When Barbara Bain won her second Emmy for playing M:I’s Cinnamon Carter, she mentioned the scribes in her acceptance speech. Woodfield and Balter were elevated to producers with the show’s third season after Joseph Gantman departed the series. It would not be a happy time. The new producers clashed with Bruce Geller, M:I’s creator and executive producer. Woodfield told Patrick White, author of The Complete Mission: Impossible Dossier that Geller went after Balter hard. “He’d know which acts were Balter’s because they’d come in on different paper from different typewriters,” Woodfield told White. After Balter’s partnership with Woodfield ended, he worked as a producer at Universal’s television operation, including serving as executive producer of some episodes of The Six Million Dollar Man and a pair Captain America TV movies. 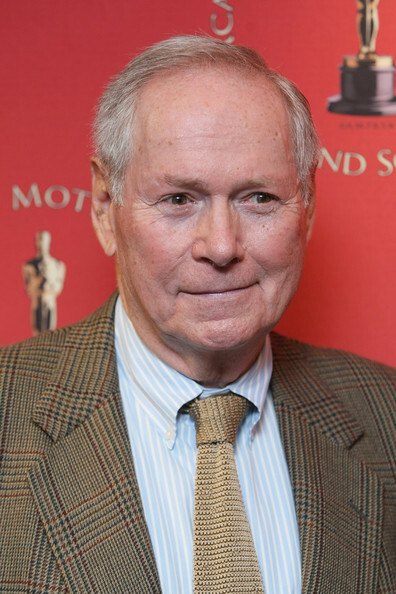 In 1978, he married Lana Wood, who played Plenty O’Toole in Diamonds Are Forever. Balter died in September 1981 at the age of 56. 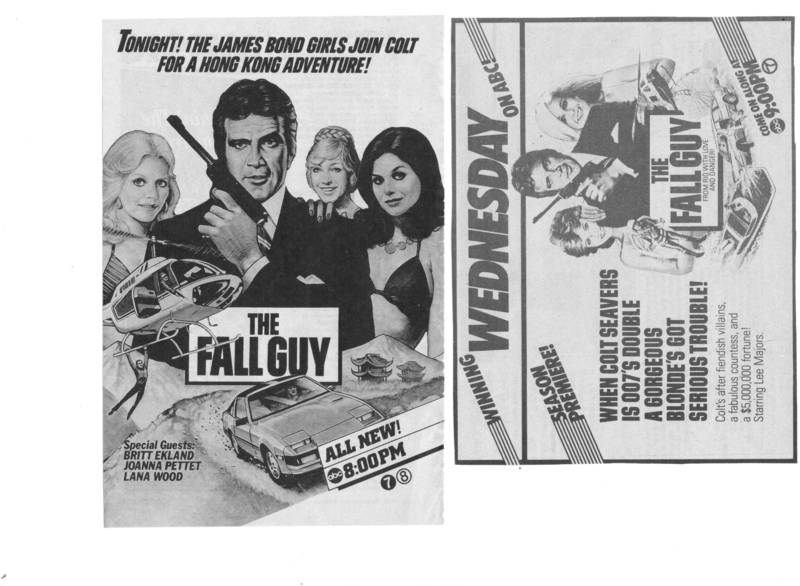 Above are two ads for episodes of ABC’s The Fall Guy based on James Bond film art. Back on Nov. 17, we carried AN OBITUARY for television writer-producer Glen A. Larson, whose credits included creating The Fall Guy, which ran on ABC from 1981 to 1986. The obituary referenced how the opening episode of the show’s second season featured stuntman/bounty hunter Colt Seavers (Lee Majors) working on a James Bond (or certainly James Bond-like) movie. The guest cast included Martine Beswicke, who appeared in two 007 films, From Russia With Love and Thunderball. A reader replied The Fall Guy had another episode titled Always Say Always, where Colt again worked as a stuntman on a Bond movie. This the guest cast included three actresses who’d worked in 007 films: Lana Wood, Joanna Pettet (from the 1967 Casino Royale) and Britt Ekland. Bond collector Gary Firuta sent along copies for ads of both episodes. The Always Say Always ad is on the left, and the ad for Bail and Bond is on the right. 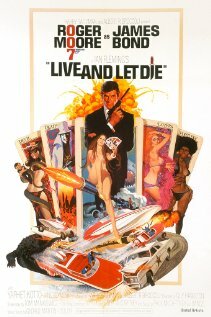 In both, Lee Majors is depicted in a Bond-ish pose, similar to Roger Moore in posters for Live And Let Die and The Man With the Golden Gun — except Majors is holding his gun in his left hand. Meanwhile, the ad on the right also looks like it has additional art that looks extremely similar to some of the art from Live And Let Die’s poster. The Live And Let Die ad showed a boat crashing into a police car. The Fall Guy ad had a boat crashing into a plain automobile. The car in The Fall Guy ad is open, with someone falling out, unlike the police car in the Live And Let Die artwork. UPDATE: Reader Delmo Waters Jr. steered us toward an August 2013 installment of the HILL PLACE blog which had a detailed look at Always Say Always. "007 Magazine? Sorry, I don't have time to talk right now." Graham Rye’s 007 Magazine has a new issue devoted to Diamonds Are Forever. Included is an interview with co-star Lana Wood, a feature on one of Shady Tree’s “Acorns” 41 years after the film and an editorial by Rye about the 1971 James Bond film, the seventh in the series made by Eon Productions. For more details CLICK HERE. The price is 9.99 British pounds, 11.99 euros and $15.99. Our post the other day about nominations for best lines from James Bond movies drew five responses. So here’s some of the feedback we got for additions plus a few we added. Q (following virtual reality exercise): Very good, 007, though killing M. was certainly not part of the exercise. Plenty O’Toole: Hi, I’m Plenty! Bond: But of course you are! Plenty: Say, you’ve played this game before! Blofeld: At present, the satellite is over…Kansas. Well, if we destroy Kansas, the world may not heard about it for years. Bond: This never happened to the other fella! 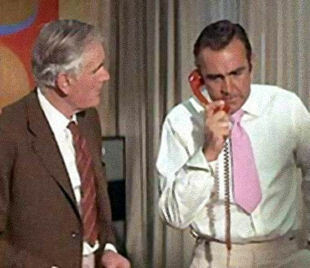 Blofeld: We’ll head him off at the precipice! Bond: Forget it. I’m feeling Italian and musical. Honey: I’m glad your hands are sweating too. Bond: Of course, I’m scared too. Grant: The first one won’t kill you. Not the second. Not even the third. Not until you crawl over here and you kiss my foot!